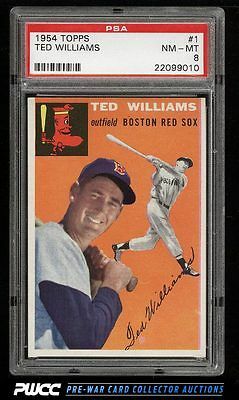 Exceedingly tough card to locate in NM-MT condition and the all important kick-start to the iconic '54 Topps issue. The offered '8' is impressive throughout and is among the better copies in the hobby. Displays four sharp corners with near flawless borders and edges. Nicely centered with bright color and nice print. Very difficult to improve upon. One of nearly 20,000 cards, lots, and sets up for bid in our 7th Auction of 2016. Click on the link above to view the other PWCC auction lots.